The vineyard is open 11 am – 5 pm daily and year-round. We offer extended Saturday hours (11am – 7 pm) from June 1st – October 1st. In order to ensure an enjoyable wine tasting experience, the last tasting is a half-hour before closing time. When is the vineyard open for tastings? Tastings are offered daily from 11 am – 4:30 pm daily. On Saturdays only from June 1st through October 1st we are open 11 am – 7 pm, with the last tasting at 6:30 pm. Do you close at all? Thanksgiving Day, Christmas Day, Boxing Day (12/26), New Year’s Day, and Easter. Otherwise, the Vineyard is OPEN all other days from 11 am – 5 pm. We offer extended Saturday hours from June 1st – October 1st from 11 am – 7 pm. What does a wine tasting include and how much is it? 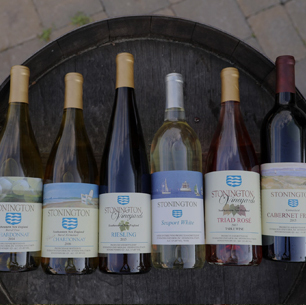 Wine tastings at Stonington Vineyards include a sample of six wines, and a souvenir glass. Tastings are $12 per person*, including tax. *Please note: Group Reservations (6 or more guests) are $20 per person, and require a reservation. Group tasting rate includes private room and restroom overlooking vineyard, designated event host, full wine tasting, and keepsake glass. Do you offer a winery tour, and is there a fee? We offer a daily and complimentary tour at 2 pm, which is weather dependent. The 2 pm daily tour is always free of charge. Private tours are unavailable on the weekends, but can be arranged during the week. Please e-mail Ebbie Young, ebbie@stoningtonvineyards.com for more information. Absolutely, picnics and snacks are welcomed and encouraged! Does the vineyard have a restaurant? The vineyard gift shop offers a small assortment of crackers and Boar’s Head products; however, we do not serve food. You are more than welcome to bring your own picnic though! May I bring outside alcohol, besides Stonington Vineyards’ wines? Our farm winery license strictly prohibits any alcohol besides our wines on property. This includes beer. Soft drinks and non-alcoholic beverages are welcome. Yes, groups are always welcome with a prior reservation. Please see our Group Tasting page for more information. Yes, Stonington Vineyards is a family friendly environment. In the warmer months we have a large lawn, and children are welcome to bring a Frisbee or soccer ball! We do ask parents use their best judgment when bringing children. Yes, pets are welcome. We kindly ask you pick up after them, and they remain on a leash. We apologize in advance that pets may not be inside the Tasting Room, but they are more than welcome to enjoy the grounds, decks, and patios. 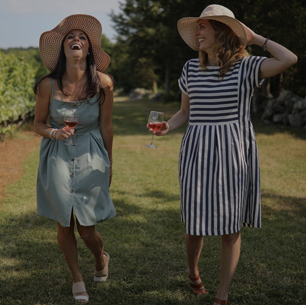 The vineyard hosts intimate events of 75 guests or smaller. 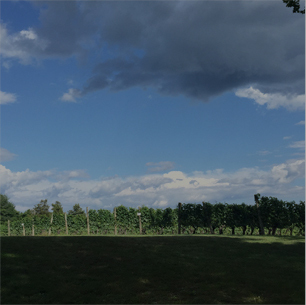 The vineyard does not host tented events, or Saturday evening events from June 1st through October 1st. We are also unable to host events on Friday nights in July & August due to our summer music series. Please feel free to e-mail our Tasting Room Manager, Ebbie Young, at ebbie@stoningtonvineyards.com.